The 1969 issue of TIME Magazine honored Alex Cushing’s success at securing the Olympics. 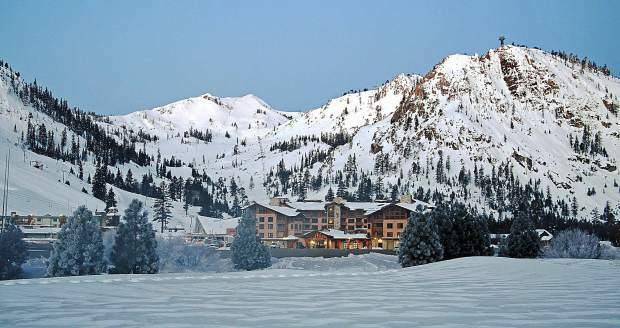 Squaw Valley, seen during the winter of 2016-17, nearly 60 years after hosting the Winter Olympics. Gold medal figure skater Carol Heiss receives congratulations. U.S. alpine racer Penny Pitou grimaces after missing the gold medal by 1.1 seconds. 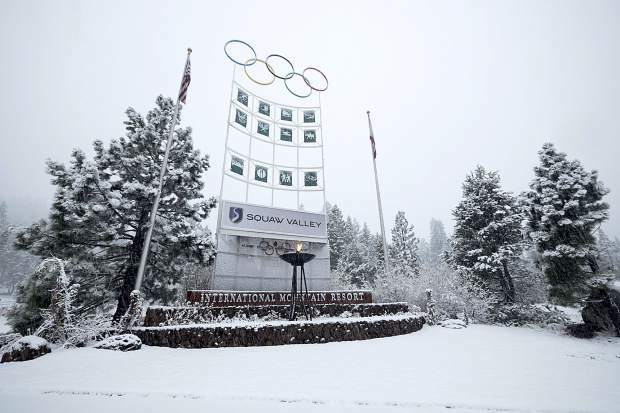 A present-day look at the entrance to Squaw Valley, which hosted to the Winter Olympics in 1960. U.S. hockey goalie John McCartan makes a save. 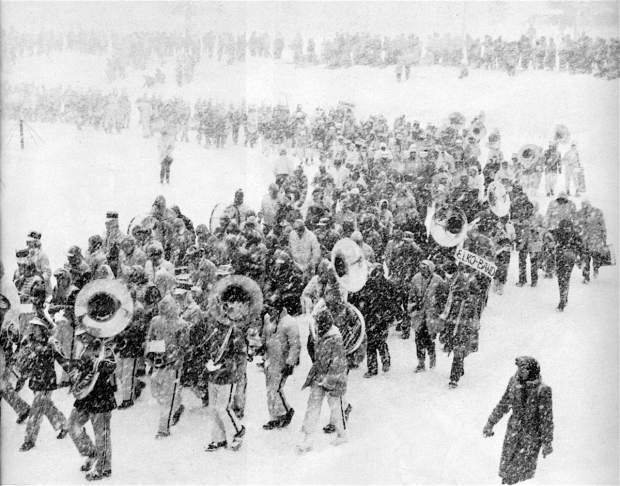 High school marching bands were clobbered by an opening day snowstorm. A skier bombs down the lower portion of the men’s giant slalom course at Squaw Valley in 1960. 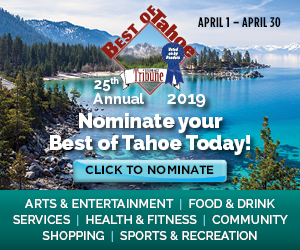 This article is adapted from the winter 2017-18 edition of Tahoe Magazine, a joint publication of the Tahoe Daily Tribune, and Lake Tahoe Action, Sierra Sun and North Lake Tahoe Bonanza. The magazine, which contains loads of features, event listings and advertisements about all that the Tahoe winter has to offer, is on newsstands now across Lake Tahoe, Truckee and Reno. Be sure to pick up a copy today. Read more here. 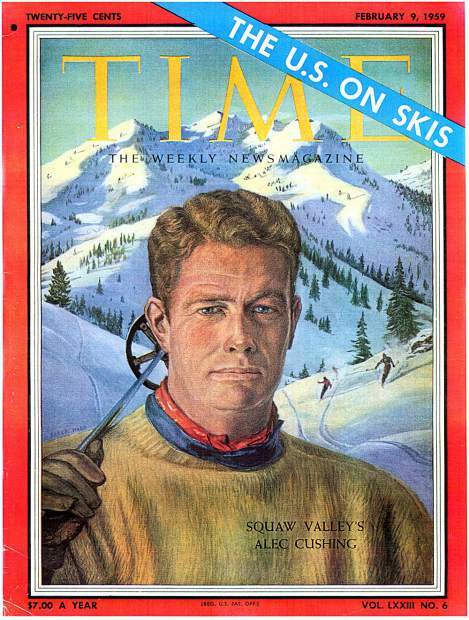 In the early 1950s, the Squaw Valley Development Company was in serious trouble. Erratic winter weather with drought, blizzards, floods and avalanches had played havoc with lift operations and ticket sales. Company president Alex Cushing was well aware that his business was struggling financially, but there seemed little he could do against Mother Nature. Then it hit him. After reading a 1954 newspaper article about the efforts of Reno and other U.S. locations to host the upcoming 1960 Winter Olympics, Cushing suddenly realized that if he could somehow beat all competitors and bring the prestigious Games to his “cow pasture with a chairlift,” the resort would be saved. The shrewd businessman knew that he would need a unique pitch to outbid America’s better-known and better-financed winter resorts like Lake Placid, Sun Valley and Aspen to secure the nomination, but his persuasiveness, persistence and luck paid off in the end. In his marketing pitch, Cushing promised international delegates that the Americans would build a private village for the athletes, an Olympic first, along with the modern infrastructure required for each event. Cushing’s persistent and persuasive efforts to grab the Games were finally rewarded when the International Olympic Committee surprisingly chose Squaw Valley over previously favored Innsbruck, Austria, by a slim two-ballot margin. Pacific storms arrived late that winter, but when they finally appeared in early January, they never let up. Relentless rain and snow lashed the mountains in the weeks before the scheduled opening ceremonies on Feb. 18. Military personnel were deployed for snow management and to protect the Olympic venue from flooding, mudslides and avalanches. On opening day, a mini-blizzard roared in and dumped a foot of fresh snow on thousands of spectators and participants. Heavy snowfall and monumental traffic jams delayed Vice-president Richard Nixon’s entourage and forced Olympic officials to postpone the opening by about one hour. As it turned out, the timing was perfect. Shortly after Nixon’s arrival to open the Games — he was allowed just one sentence — the snowstorm quit, the wind let up and the skies cleared. Bright sunshine poured down on the grateful athletes and their devoted fans. The change was dramatic with some describing it as a biblical event. Aware of the intense competition between the U.S. and Soviet Union in science and technology, some Russian delegates wondered if the Americans were controlling the weather. Walt Disney, famous animator, avid skier and part owner of the Sugar Bowl ski area, was Chairman of the Pageantry Committee. The Opening and Closing Ceremonies involved 5,000 participants, including 1,285 musical instruments played by high school bands. There were ice sculptures designed by Disney himself and various fireworks displays. To top it off, it was all paid for by Walt Disney as his gift to the Olympics. 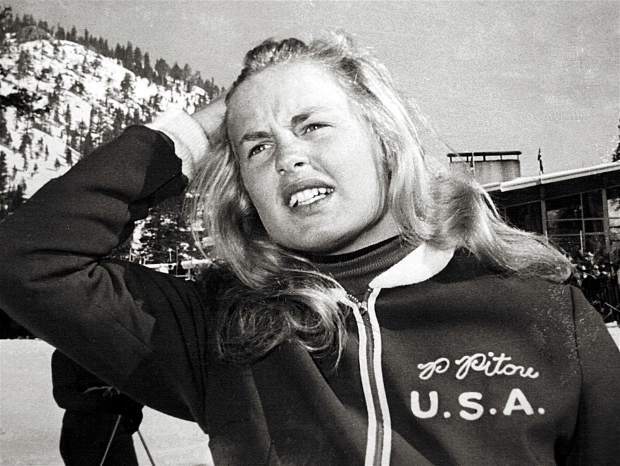 Penelope “Penny” Pitou, a 21-year-old ski racer from New Hampshire, was the top ranked American woman. As a high school student, Penny joined the boy’s ski racing team. At Squaw Valley, she won silver medals in both downhill and giant slalom disciplines. Penny became the first American woman to win an Olympic medal in the downhill race and today leads European ski tours for her New Hampshire-based business. American figure skater Carol Heiss had an especially poignant story at the Squaw Valley Olympics. Raised in Queens, New York, Heiss had skated in the 1956 Winter Olympics in Italy at age 16 and won a silver medal. 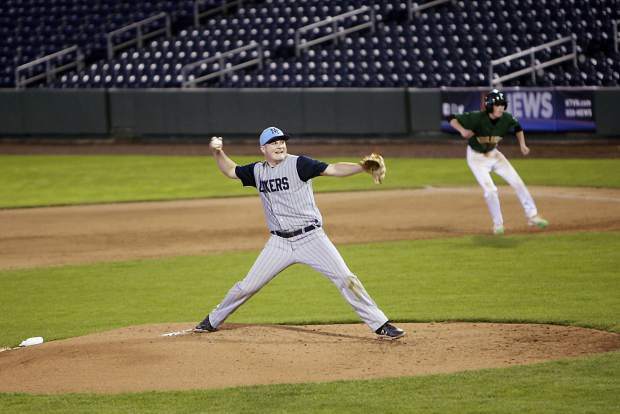 Shortly before those Games, her mother was diagnosed with terminal cancer. Carol offered to turn professional and skate in commercial ice shows for money, but her mother made her promise to retain her amateur status so that she could win a gold medal at the next Winter Olympics. 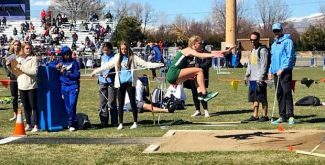 After her mother’s death, the distraught teenager dedicated herself to fulfilling the promise she had made. For the next three years she dominated women’s figure skating. Carol Heiss came to Squaw Valley on a personal mission — to win a gold medal for her mom. Despite intense pressure, her inspired skating performances were so eloquent and perfectly executed that all nine judges awarded her top scores. The following week she won her fifth consecutive world championship and permanently retired from competitive skating. Upon her return home, Carol became the first Winter Olympian to receive a ticker tape parade in New York City. 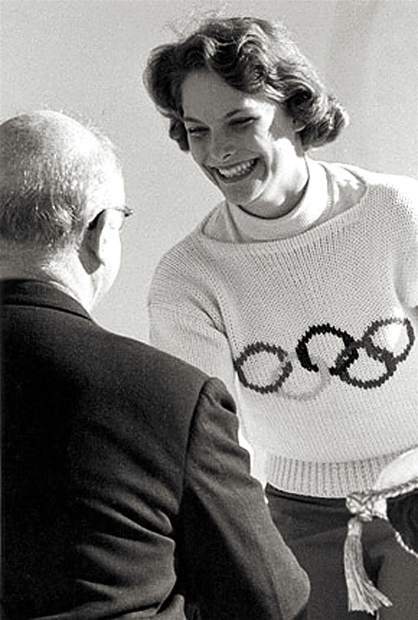 Carol married Hayes Alan Jenkins, the gold medalist in men’s figure skating in Italy in 1956. She still skates regularly and teaches near their home in Lakewood, Ohio. In 1960, Canada dominated Olympic ice hockey, and at Squaw Valley the betting money was on them again. The Russians were also a formidable team, having won the gold medal in 1956. 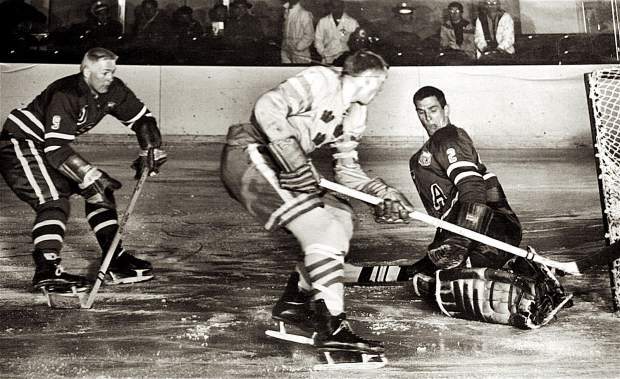 The United States hockey team had garnered six medals (none gold) in seven previous Olympiads, but in 1960 the team wasn’t considered much of a threat. The U.S. media disparagingly portrayed the American team as a recently organized ragtag group of college athletes, firemen, salesmen and talented amateur players. During their training, there was talk among the American players of revolt against their demanding, often hot-tempered coach. Despite his squad’s dissension and previous lackluster performance against collegiate teams, Coach Jack Riley remained confident that the Americans could medal at Squaw Valley. 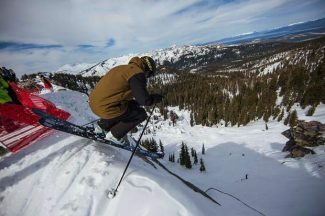 The 1960 Winter Olympics changed Squaw Valley forever and catapulted the Tahoe Sierra into an internationally recognized winter sports destination. 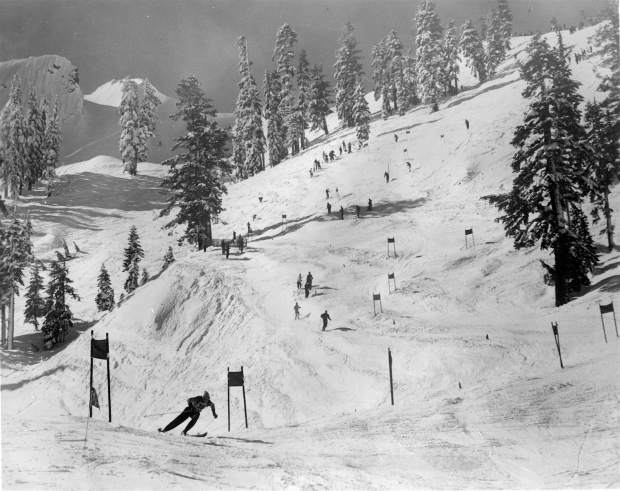 The competitions were televised live across America, which projected images of Squaw Valley and Lake Tahoe into living rooms across the nation.